Solis, O. et al. (2017) Cereb. Cortex 27, 435. Parkinson’s disease is treated with L-DOPA administration in order to restore dopaminergic signaling. However, long-term exposure to L-DOPA leads to L-DOPA-induced dyskenesia (LID), a condition which is not fully characterized to date. D1 Dopamine receptor overactivation by L-DOPA ultimately leads to LID. On the other hand, L-DOPA was found to increase the expression of D3 Dopamine Receptor, correlating with LID development. As shown in immunohistochemical staining of free floating mouse coronal brain sections using Anti-D3 Dopamine Receptor (extracellular) Antibody (#ADR-003), D3 Dopamine receptor expression is significantly upregulated in L-DOPA-treated mice (Figure 1). Furthermore, results show that LID occurrence was decreased in D3-/- mice compared to wild-type. Figure 1. Expression of D3 dopamine receptor in mouse L-DOPA-treated brain.Immunohistochemical staining of free floating mouse coronal brain sections using Anti-D3 Dopamine Receptor (extracellular) Antibody (#ADR-003), (1:100). D3 dopamine receptor staining (green) is detected only following chronic L-DOPA treatment.Adapted from Solis, O. et al. (2017) Cereb. Cortex 27, 435. with permission of Oxford University Press. Li, P. et al. (2017) eNeuro 4, e0114. IKNa currents are mainly produced by KCNT2 (Slick) and KCNT1 (Slack) channels. Activation of these channels is achieved by intracellular Na+ ions and is coupled to persistent sodium currents (INaP). Activation of metabotropic GABA(B) receptors was shown to inhibit INaP currents which in turn inhibited IKNa currents generated by Slick channels in mistral cells, localized to the olfactory bulb. Immunocytochemical staining of dissociated rat olfactory bulbs primary cultures using Anti-KCNT2 (Slick) Antibody (#APC-126) shows that the channel co-localizes with GABA(B) receptors (Figure 1). The overall out of this regulatory is to enhance the effectiveness of synaptic potentials. Figure 1. Expression of Slick (Slo2.1) channel in rat olfactory bulb.Immunocytochemical staining of dissociated rat olfactory bulbs primary cultures using Anti-KCNT2 (Slick) Antibody (#APC-126). A. Slick staining (green). B. GABA(B) R1 receptor staining (red). C. Merged image.Adapted from Li, P. et al. (2017) eNeuro 4, e0114. with permission of the Society for Neuroscience. Puissant, M.M. et al. (2017) Front. Cell. Neurosci. 11, 34. Serotonin (5-HT) neurons in the brain stem play an important role in maintaining/modulating ventilation and pH sensitivity for proper functioning of the neural network. A search of age-related changes of pH-sensitive molecules in 5-HT neurons gave rise to the identification of Kir5.1 channel as a potential candidate in CO2/pH chemosensitivity in brainstem 5-HT neurons. Immunohistochemical staining of rat brainstem sections using Anti-Kir4.1 (KCNJ10) Antibody (#APC-035) and Anti-Kir5.1 Antibody (#APC-123) showed that both channels are expressed (green). However, Kir4.1 staining is limited to astrocytes, while that of Kir5.1 is detected in 5-HT neurons (Figure 1). The authors do not rule out the possibility that other proteins, namely pH-sensitive ion channels may also be involved. Figure 1. Expression of Kir4.1 and Kir5.1 channels in rat brainstem.Immunohistochemical staining of rat brainstem sections using Anti-Kir4.1 (KCNJ10) Antibody (#APC-035) and Anti-Kir5.1 Antibody (#APC-123) showed that both channels are expressed (green). 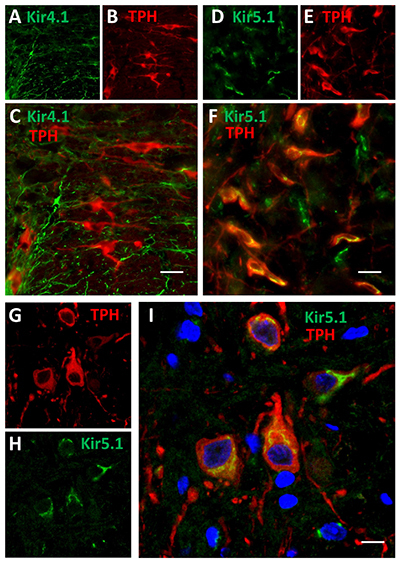 Kir4.1 staining is limited to astrocytes, while that of Kir5.1 is detected in 5-HT neurons together with the 5-HT neuronal marker TPH (red).Adapted from Puissant, M.M. et al. (2017) Front. Cell. Neurosci. 11, 34. with permission of Frontiers. Carrasco, D.I. et al. (2017) J. Neurophysiol. 117, 1690. Mechanical stimuli signaling by muscle spindles is not completely understood. 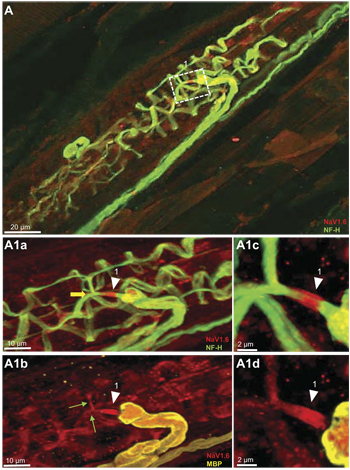 TTX-sensitive NaV1.1, NaV1.6 and NaV1.7 channels were found responsible for Sodium-persistent inward currents (INaP) in the spindle primary sensory ending. Strong immunostaining for NaV1.6 was detected in mouse sensory terminals using Anti-NaV1.6 (SCN8A) Antibody (#ASC-009) together with NaV1.1 as was detected using Anti-SCN1A (NaV1.1) Antibody (#ASC-001). Anti-NaV1.7 (SCN9A) Antibody (#ASC-008) was used to show that NaV1.7 is mostly localized to preterminal axons. The study suggests that NaVs contribute to multiple steps in sensory signaling in muscle spindles. Figure 1. Expression of NaV1.6 in mouse muscle spindles.Immunohistochemical staining of mouse muscle sections using Anti-NaV1.6 (SCN8A) Antibody (#ASC-009). 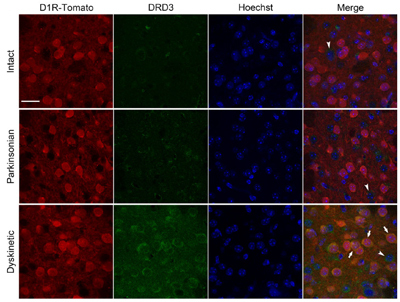 NaV1.6 staining (red) is detected in heminodes and sensory terminals of primary endings. A. low magnification. A1a through A1d. High magnifications.Adapted from Carrasco, D.I. et al. (2017) J. Neurophysiol. 117, 1690. with permission of The American Physiological Society. Thiagarajah, J.R. et al. (2017) Proc. Natl. Acad. Sci. U.S.A. 114, 568. Epithelial cells in the colon are important barriers against the environment. They generate H2O2 following injury or exposure to microbes. Aquaporin 3 water channel was shown to be a key player in transducing H2O2effects. AQP-3 is expressed in cells of mouse distal colon sections as shown in immunohistochemistry using Anti-Aquaporin 3 Antibody (#AQP-003), (Figure 1). A lack of AQP-3 leads to impaired responses to pathogenic microbes. Expression of AQP-3 in mouse colon.Immunohistochemical staining of mouse colon sections using Anti-Aquaporin 3 Antibody (#AQP-003). 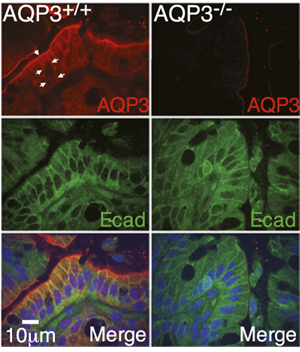 AQP-3 staining (red) is detected in mouse distal colon, and co-localizes with e-cadherin (green). AQP-3 is not detected in AQP3-/- cells.Adapted from Thiagarajah, J.R. et al. (2017) Proc. Natl. Acad. Sci. U.S.A. 114, 568. with permission of the National Academy of Sciences.